As more advertisers turn to native advertising and branded content and publishers are racing as fast as they can to meet their needs, eMarketer said it projects native digital display ad spending in the U.S. to grow 36.2% this year to reach $22.09 billion. Native digital display ads are expected to comprise more than half of all digital display ad spending in the U.S. this year, according to the digital research firm’s first forecast on native ad spending. “With native dollars now the majority of digital display ad spending in the U.S., it’s clear that native isn’t just a trend. Social sites such as Facebook and Twitter have provided the blueprint for how native can be scaled and relevant for nearly all brand types, and it’s hardly surprising to see publishers transitioning to that in-feed style to improve their user experience and move away from heavy reliance on standard banner ads,” Lauren Fisher, principal analyst, eMarketer, told Native Insider via email. “In-feed” native advertising is the key to the spending estimates. Publishers are also looking for more “mobile-friendly inventory” and trying to address advertisers’ demands for “more engaging, less intrusive ads,” Fisher noted. By contrast, BI Intelligence anticipates that native ad revenue will comprise 74% of the total U.S. display ad revenue by 2021. This aggressive projection is attributed, in part, to programmatic technology, which advertisers are relying on to scale native campaigns. The majority of U.S. native display ad spending goes to social networks, driven mainly by Facebook, according to eMarketer. In fact, it said native social network display ad spending will reach $18.59 billion this year, representing 84.2% of all U.S. native display. The eMarketer forecast also noted that native mobile display ad spending will reach $19.50 billion this year, representing 88.3% of all native advertising. Native mobile is expected to represent 64.5% of all U.S. mobile display ad spending this year. 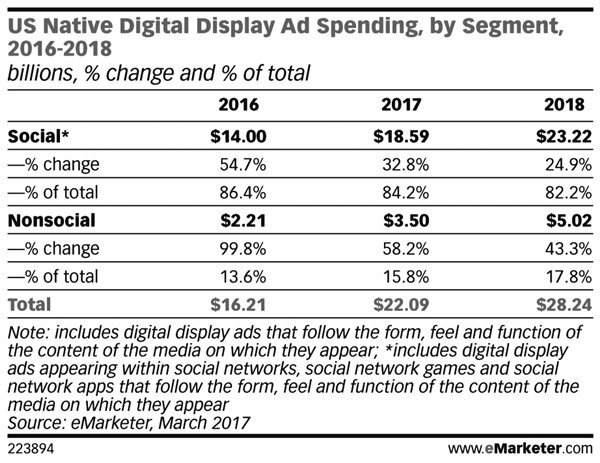 In addition, eMarketer projects that native programmatic will represent 84.0% of all native digital display ad spending this year, or $18.55 billion. Excluding social, programmatic accounts for less than half of all native non-social display ad spending. As you might expect, Sharethrough, a native advertising technology platform, is bullish on the forecast: “Native is eating the advertising world. eMarketer’s new report puts numbers to that story: with 40% yearly growth for native advertising on the open Web, beyond the social platforms,” Dan Greenberg, CEO and Co-founder, Sharethrough, told Native Insider via email. “eMarketer predicts $12 billion in growth for native across 2017 and 2018 into what will soon be an almost $30 billion industry, as traditional display and outstream video transform into native display and native outstream video,” Greenberg added.